The musical “Oklahoma” has a dance dream sequence in which the characters of Laurey, Curly, and Jud interact with each other symbolically against a very plain backdrop on which a tornado eventually appears. This tornado is sinister and its appearance is associated with changes in music, lighting, and the action on the screen. What mythic truth of American culture does it tell us about? The characters of sweet farm girl Laurey and good cowboy Curly represent the “wholesome American” ideal that was common in mythic story from the end of World War II through the mid-1960’s. That view of “a true American” was as someone white, happy, clean-cut, decent, and chaste. Cleanliness and a separation from “animal nature” in humans was a very important part of this image, and it was science and technology that were seen as essential to their achievement. For instance, women were actively discouraged from nursing their babies at that time; bottles were considered more hygienic than human tissue, and scientifically-concocted “formula” more wholesome and nutritious than milk. Commonly, the term used to refer to all this was “modern,” as in “the modern way to feed your baby is with a bottle and formula,” where “modern” meant clean, wholesome, hygienic, and Good. Such a view of scientific technology and modern progress is clearly visible in “Oklahoma” in several places, especially the song “Everything’s Up To Date in Kansas City.” Cowboy Will sings with enthusiasm about the things he’s seen there, telling the others “what the modern world is comin’ to” — including telephones, tall buildings, and gas-powered buggies. Near the end of the film, Curly tells Laurey as part of his marriage proposal that he will give up riding the free range as a cowboy and become a farmer, “buy a mowing machine and mow down the prairie” because “Times are changin’ and I got to change with ’em.” In both cases, Will and Curly embrace the changes they sing about with enthusiasm, as signs of progress. Notice that the “modern things” that are seen as Good here, and that are closely associated with the film’s clean, wholesome heroes, are closely tied to scientific and technological progress. The villain Jud is very different from Laurey and Curly. He is dark, brooding, psychotic, and dangerously sexual. He bunks in a smoke house that Curly tells him is filthy, dark, and unwholesome enough to warp his mind and heart. A musical number in which Jud sings about his frustration at having no women to make love to except the ones in the pictures pinned to the walls of his room was cut from the film, but that aspect of his character clearly remains. He tries to force himself on Laurey, threatens her when she gets away from him, and then plots to kill her and her new husband Curly on their wedding night. During the 1950’s, sexuality was the darkest and “dirtiest” part of the animal nature humans were to distance themselves from in order to be Good. Sexuality as dark and seething as Jud’s was seen as literally and dangerously bestial — hence, Curly’s direct references to Jud’s filthy and unhealthy living quarters. The “Oklahoma” dance sequence shows Laurey and Curly relating to each other and preparing to marry, then being separated when Jud interposes himself and his sexually-based threat between them. 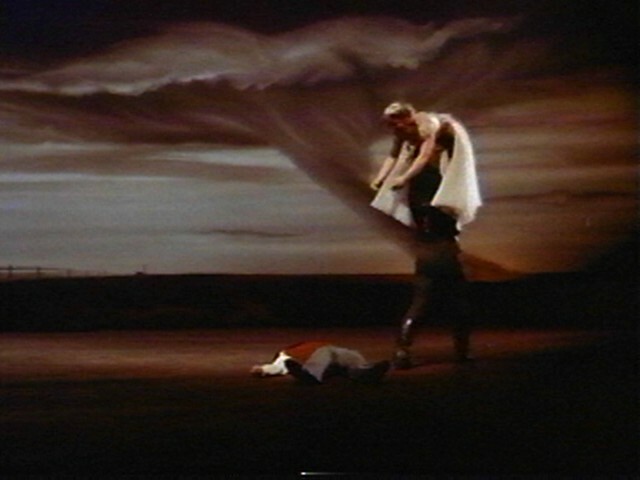 As the dream becomes a nightmare, Jud attacks and kills Curly as a tornado appears in the background, then carries Laurey away with bad intentions in mind. The tornado that appears to threaten the dancers — just as Jud threatens Curly and Laurey — symbolizes the animal, sexual power of human beings, which comes out in Jud not only as the bestial “carrying away” of Laurey, but the fighting with and destroying of Curly to do so. Here, because it has been repressed, the power is dark, brooding, and dangerous. In Laurey’s nightmare, Jud wins. Return to Mythic Ways of Knowing and Learning About Tornadoes.